From the moment that Danny Glover stepped inside the Predator spaceship and saw what was nothing more than a 20th Century Fox in joke hanging on the wall as a trophy, fans around the globe have been waiting for the inevitable showdown between two of cinemas most enduring monsters. Of course comic fanboys have known for some time what was going on when HR Giger’s biomechanoid ran into Arnie’s otherworldly hunter opponent, but still filmgoers wanted to see the two monsters duke it out on the big screen. And so, after years of gestation (pun intended), Paul WS Anderson (the WS is the important distinction between the director of Event Horizon and the director of Magnolia) brings the big uglys together. The story is a simple one: a team of humans, led by Charles Weyland (Millennium’s Lance Henriksen), are assembled to go investigate a pyramid that has been spotted by a satellite under the ice of Antarctica. The pyramid seems to be the product of several cultures. When they get there, they find that they have unwittingly stumbled into a “proving ground” for a group of young predators, who are there as a rite of passage, to hunt the ultimate prey: the Alien. This is almost a too-good-to-be-true setup for a film; high in concept, apparently bridging the gap between two franchises. Also, with its modern day setting, it acts as a sequel to Predator 2 and a Prequel to Alien. And sadly it is too good to be true, because once the film has been hastily set up, what follows is a collection of clumsy homages to the original movies: check out the first time we see the Predator ship, and watch as the whole scene copies the opening moments of Alien as the ship’s computer wakes up and projects on images on to the helmets. There’s exposition by the bucketful as every human character gets to say just enough to push the movie along and explain everything. Worst of all is the bland action. The effects are, as you would expect nowadays, of a reasonable quality, the CG Alien Queen on the rampage is a particular high point, bringing back memories of the T-Rex in Jurassic Park, but, as I have said many times before, good effects do not a good film make. The acting is serviceable, with no particular actor standing out from the crowd. This is mainly due to the poor script: not so much filled with dialogue as chunks of exposition, “What is it doing?” “Ahh, it’s a rite of passage… now things make sense” is a good example. Along with rushed pacing, this leaves no chance for the character’s motivations to become clear, or indeed any character development to speak of, beyond Ewan Bremner occasionally mentioning his kids. This in turn means that when heads start rolling and chests start bursting you couldn’t give a stuff who buys the farm and who survives. But it’s the two main protagonists, the Alien and the Predator, that are worst served by this film. If someone at 20th Century Fox expects this to jumpstart a new franchise, or to reinvigorate the original franchises, they should think again. The blame for this debacle of a movie lands squarely at the feet of Paul WS Anderson. He seems incapable of simply pacing a movie to build tension. A perfect example is those poor souls who are hit in the face with a facehugger, are infected, wake up and have an Alien shooting out of their chest in less than three minutes of the movies own internal time, which plays a big part in the film as an event happens every ten minutes, so we are told. It’s lazy, it’s stupid and it discards all four previous films, just so that we can dive into the action. Anderson, who directed Resident Evil and the detestable Soldier, has, in Alien vs Predator, made a film which often copies the original films in shots and scripting, but yet seems to lack the knowledge of what made those shots great. For example, the Predator taking its mask off in the original is copied to the frame, as is the by-now de-facto “up close teeth and drool” shot of the Alien, but neither of these shots, nor the rest of the film, can compare to the originals. Perhaps would be unfair to compare this film to the originals, if it wasn’t for the fact that there is nothing original in this movie at all, and the only thing that has any chance of originality is the action, and this is filmed in such a haphazard way that there simply is nothing to engage the audience. 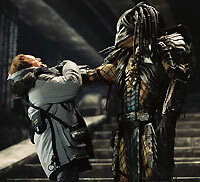 The first major conflict between an Alien and the Predators is mind-bogglingly dull and vaguely absurd, due to the way it’s been shot, which leaves no doubt there is a guy in a suit fighting a big lump of animatronics and CG. So, it should come as no surprise to know that this film is irredeemably poor. As James Cameron said when he learnt of this film being made: “It’s like Frankenstein vs. The Wolfman, it’s pointless.” And, with hindsight, he was right. In the end you come away from this film feeling as if there was no real point to the movie at all, other than to get the fans of the two franchises to shell out their hard earned cash, which means the tagline of “Whoever wins we lose” suddenly takes on a whole new and far more relevant meaning.